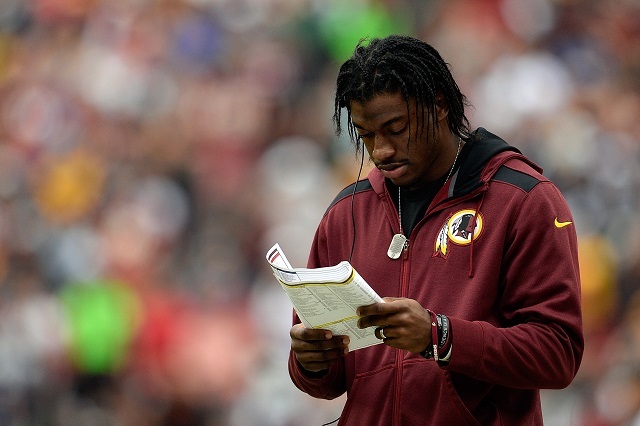 NFL: Did the Browns Make a Mistake Signing RGIII? When the Cleveland Browns officially landed Robert Griffin III, many believed they got a player who had a whole lot to prove, not a player who is slated to start immediately. Now that he’s been named the starter in Week 1 for the Browns, the question becomes: did the Browns make a mistake signing RGIII this offseason? Unfortunately, the answer may not be so much that they made a mistake, but instead that they are essentially putting all their eggs in the RGIII basket. Let’s take a more in-depth look at where the Browns have gone wrong, and what they’ve done right throughout this process. Simply put, signing Griffin in the first place was a good move for Cleveland. You’re taking a low-risk, potentially high-reward chance. Griffin has major upside, but he needed a new home, a new team, and people who believed in him. To put it simply, it’s obvious that the Browns believe in Griffin, as their 2016 offseason moves prove it to be true. The right move was definitely signing Griffin, even if it cost them $15 million over two years, which isn’t that bad, especially if he pans out. To go along with this, the Browns indicating that Griffin may start early on in 2016 was the right move. Why? They didn’t have the future quarterback at the time they signed RGIII, and they didn’t know what they were going to do in the draft. It would have been nice for the team to get either Jared Goff or Carson Wentz, but the Browns apparently didn’t feel like this was the way to go (more on that later). Lastly, we’re big fans of the two-year aspect of his contract. Give RGIII two years; if he goes crazy in the first year, then make him do it again. The Browns didn’t give him a one-year deal where he could have a massive season and then they’d have to up his pay. The two-year deal allows the team to find their potential quarterback of the future next offseason if it doesn’t wind up being Griffin. The Browns are relying on Griffin too much. Perhaps they didn’t want to draft Goff or Wentz and didn’t believe that either player warranted the No. 2 pick in the 2016 NFL Draft. Maybe they believe that Griffin is indeed the future and will be the long-term answer. All of that is fine, but the fact is, the Browns shouldn’t have jumped on the Cody Kessler train in the third round. Kessler may have upside, and maybe the Browns love him, but there were better options in the second, third, and even fourth rounds; players you could develop for a year or two, at least in our eyes. Kessler was a bit of a reach, even if head coach Hue Jackson loves him. While we love the two-year aspect of RGIII’s contract, it’s the fact that there is no set-in-stone answer if Griffin flames out and simply doesn’t have it anymore. If we see the Griffin in 2016 who we saw down the homestretch of his career with the Washington Redskins, then Cleveland is in serious trouble. Sure, they can turn to Josh McCown (if he even remains on the roster, which he should), or they can turn it over to Kessler, who 100% will not be ready to play at the NFL level in 2016. The Browns’ biggest mistake was not preparing a plan for after RGIII, or even during RGIII’s next two seasons with the team. This should have been addressed, and it wasn’t, which makes for a pretty scary 2016 season ahead. It’s too early to say whether or not the Browns made a mistake signing RGIII, but if we had to make a choice at this moment, it would be no, the Browns did not make a mistake. Not with the signing. Where they did make a mistake was with their game plan surrounding the 2016 season and their future at the quarterback position. Cleveland are betting on RGIII, and they don’t have a strong answer for if it doesn’t work out. The risk involved with signing Griffin, and the potential for him to turn things around at the NFL level; those things outweigh each other. To top it off, the Browns didn’t break the bank to sign RGIII, so there’s no reason to hate what they did there. As for Kessler’s role as Cleveland’s rookie quarterback, they’re looking at a three- or four-year project, unless you want to throw him into the fire before he’s ready. It was a bad move — the wrong move — and they did it too early in the draft. If the Browns wanted to roll with RGIII and give him a fair shot at turning his career around in 2016, they needed to be prepared for what may happen if it doesn’t work out this year. The simple answer is that they did nothing to prepare, and their only hope would be that they can land a rookie QB in 2017; one who is ready to step in and play immediately.